Thanks to everyone for your support and good wishes while five Hawaii monkeys were blasting into space at the Owens Valley the week before last. We did our best to keep the home troops entertained. It was an unforgettable experience for us in many ways. My mind is still occupied by indelible images of that severe landscape of dusty desert and magnificent mountains, and also by myriad intense moments of fear, frustration, excitement and elation. In an effort to sort through some of those memories, I thought I’d offer a recap of the week, for anyone not already tired of hearing about it! 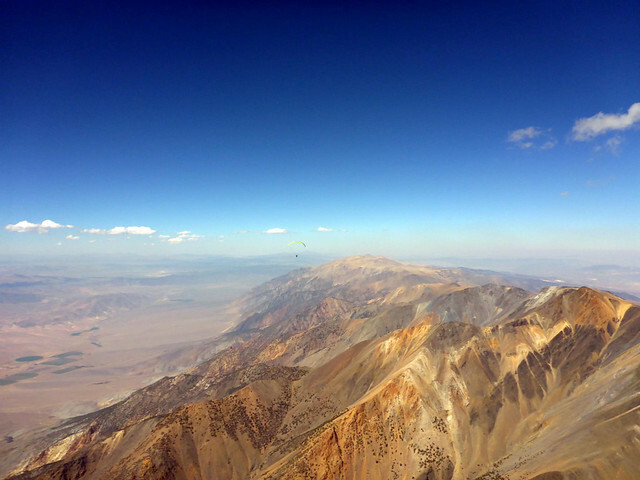 We ventured across the ocean to the mythical wild west flying venue that is the Owens Valley, to compete, or at least participate, in this year’s second national paragliding championship. We went there to try our hands at climbing high in some of the strongest thermals in the world, and to fly alongside (or more often, way behind) some of the best pilots in the world, and hopefully learn a few things from the experience. By that measure I think we were quite successful! Eighty one pilots from twelve countries took part in the first US national championship at the Owens since 2008, when we sent Doug, Dave and Quentin over. That year they only flew two task days, while the other days were called off because of windy conditions. Apparently the typical pattern is three or four consecutive days of flyable weather alternating with three or four windy days. But I remember seeing the tracklog of Dave's best flight there in 2008, a rocket ride to fifteen grand and then a fifty mile thermal mission. I was so hopeful that we could get a chance to do something like that! This year we were fortunate to fly five consecutive days: four task days and one practice day, followed by three days that were too windy. We ended up flying many personal bests in distance and altitude, and we fell in love with that strange and otherworldly landscape. We learned how to use supplemental oxygen, we learned about the dangers of frostbite, and we learned about real life reserve deployment. The organization was top notch. The competition was organized by free flying legend Kari Castle, with Denise Reed acting as Meet Director. They assembled a crack team of volunteers to pull off what many experienced competitors have called the most organized event they’ve ever attended. Dave Wheeler not only scored the event along with Bill Hughes, he also is responsible for the software that allowed both the organization and our friends at home to track our progress along the tasks each day. Julie Speigler and her husband Gever Tulley created a new online system to help manage the retrieve operation, always a logistical challenge for any competition, but especially for one covering this much ground over a vast desert wilderness with very few paved roads and very little cell coverage. Zak Hargraves filled in for Reaper as safety director, and Jeff Huey was launch and task director. Gabe Jebb brought 4WD vehicles from Torrey and helped out with weather briefings each day. Leon Schatz put together some sweet videos of the flying action each day. And zillions of other volunteers played countless important roles. Thom, JK and I enjoyed a wonderful week of camaraderie and cohabitation, bunking together in what we came to call the barracks at the Best Western. Many pilots brought RVs to park in the area, while many others camped or stayed at local hostels. I told Thom that camping sounded like a nice idea, but I just had to admit that I’m soft: I need a real bed. Not to mention a refrigerator where I can keep nourishing cold refreshments, and outlets to charge my arsenal of instruments. Poor JK was a late addition to the barracks, and he had to camp on our floor because they wouldn’t give him a cot. He is definitely not soft. And I guess Christopher and Scotty from the Big Island must have camped somewhere nearby. They are definitely not soft either! And those guys are always charging the thermals at these mainland sites and competitions. It was an honor to have our neighbor island thermal masters rounding out the Hawaii team! For logistical and regulatory reasons, the comp was staged at the lowest launch in the valley, just 1,500 feet from the valley floor, though it felt more like only 500. Unfortunately that added an extra layer of challenge, because just getting up and out from that low spot was never a guarantee on any given day, especially when there was any valley wind. Which was most days! I sloshed around in that mosh pit with Thom and JK and lots of other pilots way longer than I wanted to be there each day. A couple of pilots had serious bad accidents while flying low in that windy soup, which helped to remind us all of the importance of staying high and away from terrain. But it wasn't easy to do that. For me, most days went like this: struggle to stay up; struggle to climb above launch, while keeping my distance from the terrain; struggle to stay with any particular cluster of pilots, or even a single other pilot; struggle to head out along the course line all by myself from a very modest height. Did I mention it was a struggle? On most days I lost the plot early, and ended up landing not far from the bomb out LZ below launch. But on two consecutive very special days, I forced myself to stick with the program, and I managed to struggle along the course line way farther than I expected. Which was about fifty miles each day, flying for four and a half hours! I had little to no company for most of that time: every now and then I’d see a random pilot way below or way above, but almost never anywhere nearby. It was pretty surreal to be flying so alone in such a vast place. And during those two long flying days, I experienced a few moments I’ll never forget. I can’t adequately describe the adrenaline fueled ecstasy of launching into space out of a missile silo canyon built into a 14,000 foot mountain range in the California desert, blasting above the highest peak even faster still, and gazing across the range into Nevada, which suddenly appeared to be visible in its entirety. All the while listening to the craziest lead guitar licks from my vario. Followed by a less ecstatic feeling of having to pull out of the lift at 17,000 feet because my hands were numb and actually starting to get frostbite. I guess it was just as well, or I might have risked busting airspace. But man, I want to go back to that place and do that again. Next time with serious electric powered gloves! Nor will I soon forget starting to cross the valley too low from Boundary Peak, and then finding sweet flatland thermals halfway across, enough to hop the low hills and blaze out over another huge flat valley covered with salt flats and a single lonely road. And I vividly remember the feeling of landing out on both of those days, descending to realize that every open patch of sand that had looked good from above was actually full of more desert sticker plants than I could have imagined. Sometimes returning to earth can be the most memorable part of a flight. I know JK would agree with me! I also won’t forget the one strange chance meeting JK and I enjoyed out in front of Boundary Peak as we tagged it and benched up for the return leg. It was so surreal to run into a buddy out of the blue in such a vast and desolate place. And it was amazing how fast we got separated soon afterward! I never made it to goal in this event, my 11th competition in 10 years. Some years I make goal, and some I don't. Some years I barely get out of the start cylinder. We have to remind ourselves that the tasks are designed for only 20-30 percent of the pilots to make it on a given day. My best day this year was 80 km out of 86 km or something like that, a few km behind JK on that day. But somehow out of the three scored task days, I ended up bumbling my way to 42nd place out of 81 pilots in this event. That’s for sure my best result in a nationals level competition. And I ended up 13th out of 37 pilots in the sport class. Considering there were at least five PWC ringers slumming it on sport wings here, that felt pretty good! I am happier than ever to be flying this new wing - it really was a pleasure to fly even in the roughest thermals. Mads calls it a school glider! But Hugh has some high praise for it in this month's XC Mag review. Thanks again to Rob and Pete for such an excellent new machine. I also want to effusively thank Thom and JK for all the support and cheer and cold refreshments! Oh, too, (see what I did there? ), thanks to Alvin and TimO for the loan of their excellent O2 systems! Sea level monkeys need all the oxygenation we can get! And thanks to Tom Keefer for all the pretrip advice! Thanks for the recap Alex!! It is good reading on a slightly chilly north morning (great with coffee)! I saw this posted last night and it was all I could do to not read it then; but, I saved it for my morning joe. Thanks for the guitar licks and the "Oh, too" in addition to the great para-phrasing. You all did great and I, for one, was following the monkey progress as I could each day--pretty neat what a few crazy folks can do with a nylon sheet and some string. Sorry about no Gunther launch, better in every way except the drive up. Might have saved some pain as well. High, above the valley flow and the valley inversion, if you bomb out from there, then you deserve to. Great write up.. I wish they would have put you guys on Paiute like all previous versions of the comps there that I know of. I always thought that the lower elevation launches like Flynn's were best for trying to eek out a nice glass off to recover an otherwise unflyable day or to wind down after a booming day that rattled you. Props to you guys for getting up and out of there in mid-day conditions - I don't want to think about what that must have been like! Great story, Alex! Congratulations Team Hawaii!